You can find Estes Park kayaking and canoeing in many calm lakes in the area. For a more rigorous experience, there are several river drops where kayakers paddle white waters. This marina is right on Lake Estes. Rent a boat, bike, canoe, kayak or throw out your fishing line! 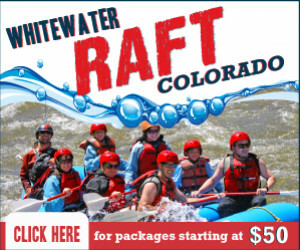 Rafting trips on Colordo's ONLY Wild and Scenic River near Fort Collins and Estes Park, the Cache la Poudre! St. Vrain River has fun rapids for kayakers! Where should I go Kayak/Canoeing? Sharp peaks surround these 4-shoreline miles. 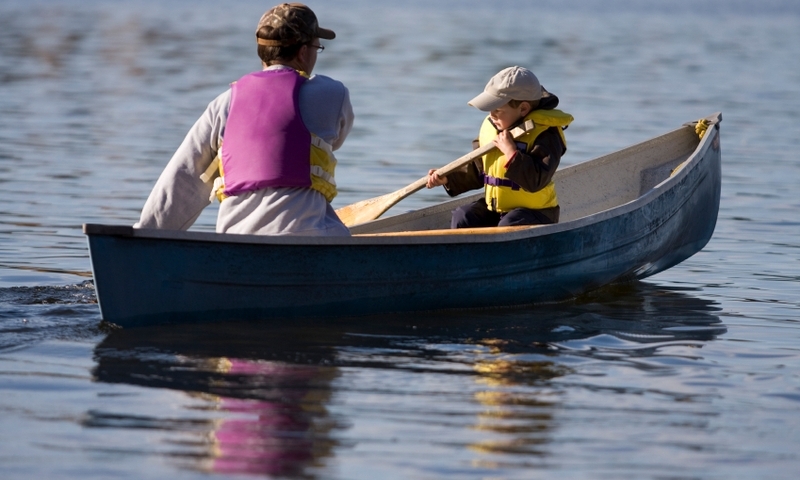 Choose a fishing boat, pontoon, paddleboat, canoe, or kayak to explore! After boating, go around the lake on a paved path that’s great for running, skating, and biking. Location: Drive into Estes Park west on US 36. The lake is on your right side. Marina/Boat Launch: Launch your boat at Lake Estes Marina, on the lake’s north side. Boat Restrictions: No jet skis. Wakeless water, unless pulling a water-skier. Noise decibel of boats can’t be above 40. Fishing: Fish from a boat or on shoreline for rainbow trout, brown trout, Kokanee, Yellow Perch, and Walleye. Tremendous Rocky Mountains abruptly appear by Grand Lake and its water. Sail, water-ski, canoe, kayak, or fish on Grand Lake—the largest natural lake in Colorado! Shadow Mountain Lake is connected to Grand Lake, so your exploration expands. Location: West on US 36 into Rocky Mountain National Park, through Beaver Meadows Entrance. Take Trail Ridge Road to Grand Lake. Marina/Boat Launch: Launch your boat at West Portal on the lake’s east end. Marinas include Grand Lake Marina and Trail Ridge Marina. Boat Restrictions: 55 mph speed limit. 32-foot clearance beneath the foot- bridge that crosses above the channel. Camping: Rocky Mountain National Park’s campgrounds are close by. Green Ridge campground is on the south end of Shadow Mountain Lake. Fishing: You’ll find various kinds of trout and land-locked sockeye salmon called Kokanee. Southeast of Estes Park you’ll find the town of Lyons, and sections of St. Vrain river for tubing and kayaking. Put-Ins: Meadow Park and Bohn Park. For Meadow Park, go west of the intersection of Hwy 7 (5th Ave) and Railroad Ave. For Bohn Park, go south of Park St. off of 2nd Ave.
Rapids: Black Bear drop is a Beginner/Intermediate drop. Downstream is A-hole drop, which is advanced. Enjoy these kayaking playing holes! Fishing: Bohn Park is a popular access for Fly-fishing. Lookout for Brown, cutthroat and brook trout, and rainbows. Rocky Mountain National Park’s serene lakes are relaxing to paddle through. Sprague Lake is popular for its beautiful scenery and its accessibility. Location: Take US 36 west through Beaver Meadows Entrance. Turn left on Bear Lake Rd. Continue to Sprague Lake Trailhead. Boat Restrictions: Canoes and Kayaks only. Camping: Glacier Basin campground is nearby. Some Glacier Basin campsites accept reservations and others do not. Fishing: Sprague is stocked with Trout! Do I need a permit/license? A Colorado fishing license and camping permits are required. I am looking for a kayak/canoe guide. Mountain Whitewater Descents offers a variety of kayak lessons. Choose a full or half day. Learn to navigate the rapids of the Cache La Poudre River!